Platinum Album Award, Awarded Jan 16, 2000 in A.S.A.P. Quadruple Platinum Album Award, Awarded May 2, 1999 in A.S.A.P. Do That To Me One More Time? 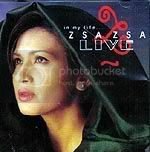 ZsaZsa Padilla, Proudly powered by WordPress.